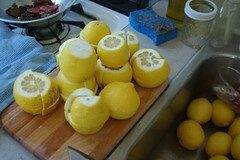 Next, I quartered green pears and sliced up Asian pears, dipped them in lemon juice and put them out in the solar dehydrator. I had to work fast - it was getting late and I wanted to take advantage of as much heat of the day as possible. FRUIT BRANDY: After getting the fruit out in the solar dehydrator, I decanted the fruit brandies -- a half gallon jar of apricots (and pits) and another jar of those gorgeous Santa Rosa plums and ginger spent about six weeks in vodka. My friend Eric had recommended leaving the pits for the apricot infusion, resulting in a complex apricots and almonds scented infusion. The apricots held their form pretty well and only diluted the 750ml bottle of vodka by a cup or so. The Santa Rosa plums nearly completely broke down into mush - James helped with filtering the brandies in the jelly bag and with a complicated system of wire mesh filters, and we still ended up with about a bottle and a half of liqueur -- it diluted by about 50% because of the break down of the plums. Both taste delicious -- the apricot infusion doesn't require any sweetening, but the plum-ginger is a bit tart. DRYING: At the end of the day, we took the fruit out of the solar dehydrator. 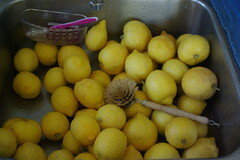 The fruit hadn't really dried much, and the oven thermometer showed that the temperature inside was about 115 or 120. That's not quite not enough.